Our massive collection of Irish records just got a lot bigger, making your Irish heritage easier to trace than ever before. 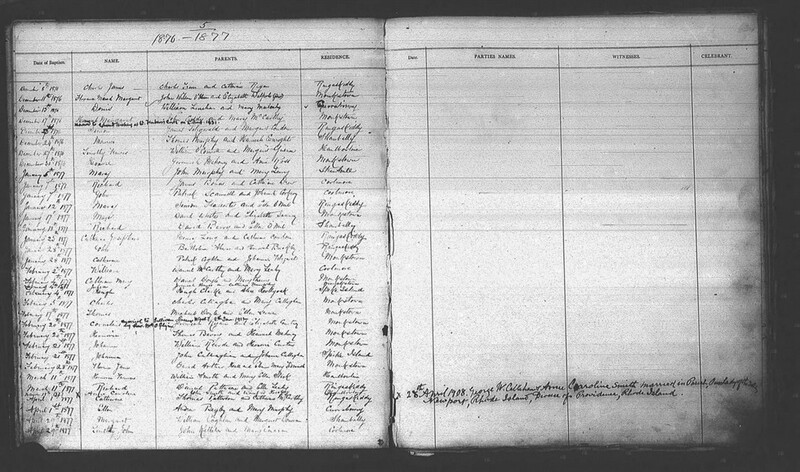 Last week at RootsTech, we were thrilled to announce the upcoming release of a massive collection of Irish records: Our 10 million Irish Catholic Parish Records will be released this March, becoming one of the most important of our many Irish collections. Family historians will now be able to make all important links between generations with the baptism records and between families with the marriage registers. These essential records cover the entire island of Ireland - both Northern Ireland and the Irish Republic. If you have Irish ancestry, our Irish records collection is the go-to resource to trace your family history back across the Atlantic. The note indicates a 1908 marriage of Ann Caroline Smith to George W. Callahan in Newport Rhode Island. But how would this have been marked, over 20 years after her baptism? Most likely, the Catholic Parish in Ireland received an inquiry from Rhode Island before Ann Caroline was officially married to George - after all, to be married as a Catholic, you need to have been baptized. . In this case, her home-town Parish priest decided to leave this note in the parish register - a nice thing to do, and an amazing find for a genealogist!